Informal games: less than 30 minutes. Luzhanqi (Chinese: 陆战棋; pinyin: lùzhànqí) (lit. “Land Battle Chess”) is a two-player Chinese board game . There is also a version for four players. It bears many similarities to Dou Shou Qi, Game of the Generals and the Western board game Stratego. 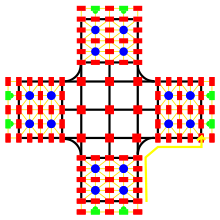 It is a non-perfect abstract strategy game of partial information, since each player has only limited knowledge concerning the disposition of the opposing pieces. Because of the Chinese nature of the game, terms used within the game may vary in translation. Luzhanqi is mainly played by children as a precursor to games like xiangqi and weiqi, but people of other ages may also enjoy it as a game of leisure. The aim of the game is to capture the opponent’s flag through penetrating his defenses, while trying to prevent him from capturing the player's own flag. The Luzhanqi board has a number of features which affect how pieces move. Post (兵站) - also Soldier Station: a normal space, marked as a rectangle on the board. Pieces can move on or off these spaces at will, and can be attacked and captured on them. Roads - usually marked as thin lines on the board. A piece can only travel one space across a road at any time. Railroads - usually marked as thick lines on the board, a piece can travel any number of spaces along a railroad in a straight line, as long as its path is not obstructed by another piece. Campsite (行营) - marked as a circle on the board, with 5 in each player's territory. A piece on a campsite cannot be attacked. Mountains (山界) - pieces cannot move over these two spaces. Frontlines (前线) - these three spaces are the only points at which a piece can enter the opponent’s territory. Pieces do not land on these spaces, they pass over them. Headquarters (大本营) - positioned at two sides of the central axis at the sixth rank of the player's territory, the Flag must be placed on one of these two spaces. It, together with the other piece placed on the other headquarters, must not move after the game starts. The Engineers are the only pieces which can turn corners when travelling along the Railroad. Engineers can also capture Landmines without being removed from the board. Bombs, when in contact with any opponent piece, destroy both itself and the piece. They may capture the opponent's flag. Bombs cannot be placed on the front line (the first rank) during the initial set-up. Landmines are immune to any attack, and cause the destruction of attacking pieces (except when attacked by an Engineer or destroyed by a bomb). Depending on the ruleset used, Landmines may or may not be removed from play following a capture. Landmines may only be placed on the fifth and sixth ranks during set-up. The Landmine cannot move from its original position. The Flag must be placed on one of the two Headquarters spaces on the sixth rank. It cannot move. Its capture brings the victory of the attacker and ends the game. Also, when Field Marshal is destroyed, the Flag must be revealed to the opposing player. Both players begin by arranging their pieces on their half of the board, with the markings that indicate rank facing towards them (and hence invisible to the opponent). Some version allows the pieces to be placed face up, allowing both players to see them. Initially, all pieces must be placed on posts or headquarters; bombs may not be placed on the first rank, landmines must be placed on the last two ranks, and the flag must be placed in one of the headquarters spaces. Play then proceeds by turns, with each player moving one piece per turn. On each move a piece may move to any connected adjacent space, or use the Railroad lines to travel to more distant spaces. When a piece lands on a space occupied by an opposing piece, the respective orders of the two pieces are compared (either by the players or by an independent referee). The lower-ordered piece is removed from the board; if the two are of equal order, both are to be removed from the board. Special pieces (see above) also play their respective roles. As soon as a player's Field Marshal (order 9) is lost (having collided with the opposing Field Marshal, or was destroyed by a bomb or landmine), he must declare so by revealing the headquarters in which his Flag is placed. It is feasible to send the Brigadier Generals or Major Generals (order 6 and 7) to attack the opponent's pieces, for these pieces are effective in getting rid of lower-ordered pieces and identifying those of higher order. Smaller-ordered pieces can be used to infiltrate the opponent's campsites, while Engineers are employed to remove landmines when the route to the opponent's fifth and sixth ranks is clear. Bombs should be sent to campsites as soon as possible to prevent accidental bombing, and should only be employed to destroy the highest-ordered pieces of order 8 and 9, to defend one's own flag from being captured, or to destroy a blocking landmine. The arrangement of landmines and nearby pieces should also be carefully thought out to secure the defense of the headquarters. One of the main spin-offs of Luzhanqi is derived from arranging a board for four-players, with each taking up a territory adjacent to another at 90-degree angles. Players at opposite ends team up to defend against the other pair; the game ends when both players of a team has their flags captured, or when all sides are unable to defeat each other and thus agree to a draw. If a player has his flag captured, he must admit defeat, thus removing all of his pieces off the board. He may also do so by resigning if his situation looks hopeless. In this case, if his ally across the board is still in the game, the game continues; otherwise, it ends with the victory of the other team. Even if a player admits defeat or resigns, his team may still win if his ally is able to defeat both opposing teams. As shown in the diagram, there will no longer be Mountains or No-man's Lands, for the 9 shared spaces in the middle of the territories will be public territory; there will, however, be curved railroads, where the rule for railroads still apply across the curve for all pieces: moving pieces can still travel along any part of the yellow line in the diagram, but not in the direction of the arrow. Engineers are still spared from this restriction and may move to any space accessible via railroads. 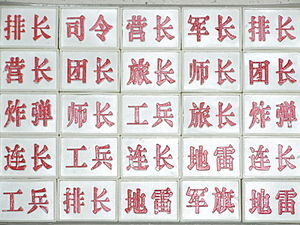 There are many variant rules of Junqi. Before a game, players usually decide which rule to use. "Flying Bombs": Under this rule, Bombs move the same way Engineers do. "Explosive Mines": Under this rule, An attempt by pieces (other than an Engineer) to capture a Mine kills both the moving piece and the Mine, as opposed to killing only the moving piece. An Engineer still captures a Mine. This rule is more common in 2-players game. "Flag Carrier": Under this regional variant, games are not won by merely capturing flags. In order to win, a player has to let a piece "take" the flag with it, and carries it back to his/her own flag. A piece carrying the flag moves normally, and if it is captured, the Flag returns to the original headquarters it was in. Also, under this variant, pieces do not become immobile upon entering a headquarters. "All Visible": Under this rule, all players place their pieces with their marked side up, that is, making all pieces' rank visible to all players, effectively making it an abstract strategy game of full information.